« Raga CDs des Monats (07/09): Tradition & Moderne – Eine Hommage an Ali Akbar Khan. Raga CDs of the months (07/09): Tradition & Modernity – A Tribute to Ali Akbar Khan. „A Tribute to Ali Akbar Khan“- IM OnAir’s radio show in July 2009 honours one of the Legends on the Sarod, the Johann Sebastian Bach of North Indian Classics or simply Khansahib as Ali Akbar Khan was called in India affectionately. Beside annual world concert tours and as film composer he worked for more than four (4) decades particularly as an outstanding music teacher – in the Ali Akbar College of Music (AACM) which was founded by him. Khansahib was an exception at the firmament of Indian music. He understood music as an universal language. Music as food of the soul, a musical sound affecting everybody’s heart and spirit. „The bliss, the joy of Ragas one experiences if one dies for it. Death is the condition for this blessedness. For a Raga we live, and we die for it. That is the whole secret, which it concerns in the teacher pupil relationship, Guru Shishya Parampara. How about the invaluable legacy of Ali Akbar Khan? – Khansahib leaves seven sons and 4 daughters form three marriages. His oldest son Aaashish Khan is a renowned Sarod player, two further sons, Alam and Malik play also the instrument of their father. The family Khan feel constrained resuming the Ali Akbar College for Music (AACM) and the Ali Akbar Khan Library. 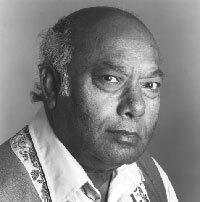 Ali Akbar Khan leaves us an immeasurable fund of audio documents. Since 2007 with conveyances more than 1000 concerts with 1500 hours play time and approx. 6000 documented lessons are reformatted for the structure of a digital library. Until today approx. 2000 hours audio material are archived. IMC OnAir delivers to you smoothing your ears some beautiful tunes: the ragas Chandranandan, Darbari Kanra, Gauri Manjari, Medhavi, Manj Khammaj, Sindhi Bhairavi and Jogiya Kalengra. This entry was posted on July 13, 2009 at 3:02 pm	and is filed under ENG (English), IMC OnAir - News. You can follow any responses to this entry through the RSS 2.0 feed. You can leave a response, or trackback from your own site. Well written 🙂 Did not know there was so much of his audio documented!